With the Maximus IX Formula, ASUS launches the successor of the Maximus VIII Formula, which was based on the previous generation Z170 chipset from Intel. 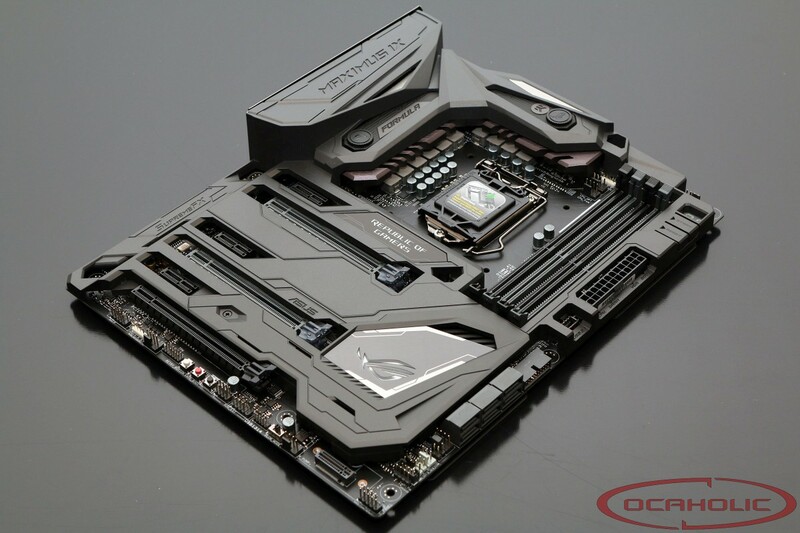 This Z270 base motherboard comes with a plastic cover on the fron and a metal plate on its backside, which we know from earlier Formula series motherboards. Apart from that there are numerous features to have a look at and we're apparently going to run our benchmark suite on this contender. So far the ASUS Maximus IX line-up consists of four motherboards and two of them are completely new models. Apparently the Maximus IX Formula is the successor of the Maximus VIII Formula and therefore not a new but an upgraded model. At a first glance not much has changed, so we have to look for the details to see what has happened behind the scenes. The Maximus IX Formula has been equipped with ASUS' "armor", which is a plastic cover for the front side and a sturdy metal plate for the back side. Apart from that there is the Aura RGB backlight, which allows you to change the illumination of the board from within Windows. The layout is highly similar to what we've seen on the Maximus IX Code. There are three full-sized and metal-strengthened PCIe slots, which have been wired using 16/8/8 PCIe Gen 3 lanes - from top to bottom. On the storage side we see two M.2 slots, one is hidden underneath a removable cover, and the other one can be vertically mounted in the bottom right corner of the motherboard. There is a total of six SATA ports and no SATA Express connectors anymore. With Z270 it’s interesting to see that the unsuccessful SATA Express interface is finally going away. Like with the predecessor the VRM received water cooling from EK Water Blocks and several fan headers for pumps, AIO water blocks and fans. Apparently the Maximus IX Formula is the right motherboard for water cooling enthusiasts. Since the Formula is undoubtedly a high-end motherboard features like onboard buttons and debug display can't be missing. This is certainly a good looking motherboard, although personally we’re starting to feel like we’ve seen enough plastic covers on motherboards. Nevertheless this will not stop us from having a detailed look at this board and send it through our benchmark parcours.